U.S. regional carrier CommutAir considers day-time maintenance in Albany. Fast growth imposes the most strenuous demands on mechanic recruitment, but fast growth can itself be an attraction, for the career-advancement opportunities it offers, to young mechanics. At least that’s the way it looks at CommutAir, a U.S. regional carrier operating 30 ERJ145s now and headed for a fleet of 61. Chief operating officer Joel Raymond says he has 275 maintenance workers now to do all except heavy checks on his airframes. “We outsource C checks, and engines are under Rolls-Royce Total Care.” Raymond wants to add three to eight mechanics a month as his fleet grows. For the near term, the regional will maximize the use of its main hangar in Albany, New York. It also has line maintenance stations at Dulles and Newark. One approach Raymond is looking at is doing daytime maintenance. “This could double our capacity at Albany and be a significant quality-of-life benefit to our maintenance personnel there,” he notes. For the company, this would mean trading off more downtime for the ERJs against getting much more use out of the facilities, overhead and tooling at Albany. For mechanics, it would mean more desirable day shifts, rather than night-time work. Daytime maintenance would economize on infrastructure, but it would still require the same number of mechanics. And as CommutAir continues to grow, it may need both more facilities and workers. “As we look toward the latter part of 2019, I would anticipate expanding our geographical footprint, and fleet growth will make us add a base by that time,” Raymond predicts. As a regional airline, CommutAir generally gets its new mechanics fresh out of schools and gives them their first airline experience, plus training. One recruiting advantage is that regionals generally are based outside major metropolitan areas, an attractive option for a young mechanic looking for an affordable cost of living and an easier commute. But the airline must be strong on training, and CommutAir uses both in-house training and OEM courses, for example Rolls-Royce classes on engine theory. CommutAir works closely with maintenance training schools for the bulk of its recruitment but will also hire experienced mechanics at pay and responsibilities commensurate with their knowledge and experience. And a big advantage of that fast growth is that new hires can look forward to advancing, either along a technical track to become specialists, subject matter experts or maintenance control specialists, or along a supervisory track to become leads and supervisors along with other managerial roles. So far at least it’s working. His ERJs, many of which are 12 years old, have had only one maintenance-related cancellation since March, and a long similar streak before that. “Given that we transitioned from turboprops to jets over the past 12 months and are still learning our way around complex issues like MTBFs, materials and planning, our solid performance is a testament to the capability of our maintenance staff,” Raymond stresses. He says the Embraer experience of Lon Ziegler, vice president of maintenance and technical Services, has also been very helpful. 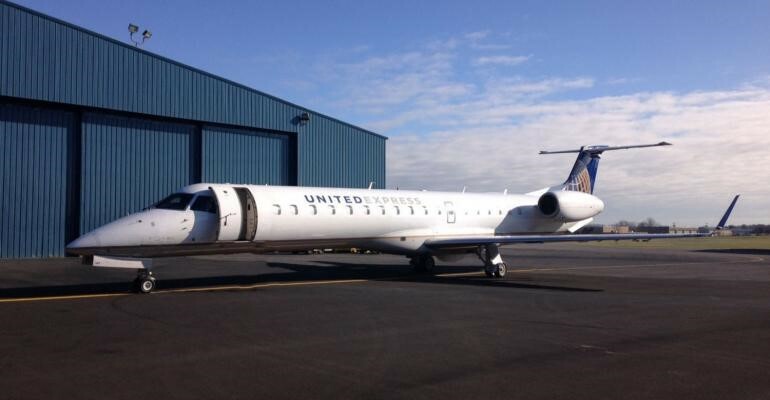 CommutAir’s new routes in Canada to Montreal, Quebec and Ottawa will require new contracts with firms that can supply on-call, unscheduled maintenance at these destinations. And along with fast growth, the airline is also advancing technically. It has begun testing electronic flight bags for pilots, with charting and manuals being initial functions. Electronic log books are not used now, but their use will be explored. Data is transferred on the ground now, but the EFBs are compatible with connectivity in flight.